To make a huge difference in the looks of a house just add some siding. I will give a few ideas here on how to install siding on your home. When planning out the installation try to make sure you stay at the same level all the way around the house if possible. Is best to take the time and mark a level line around the bottom of your home. Some older homes are not very level so would advice checking the vertical level also. If not very straight use one by three furring strips to level the walls. A few packages of shingles will help you accomplish this along with quite a bit of time. 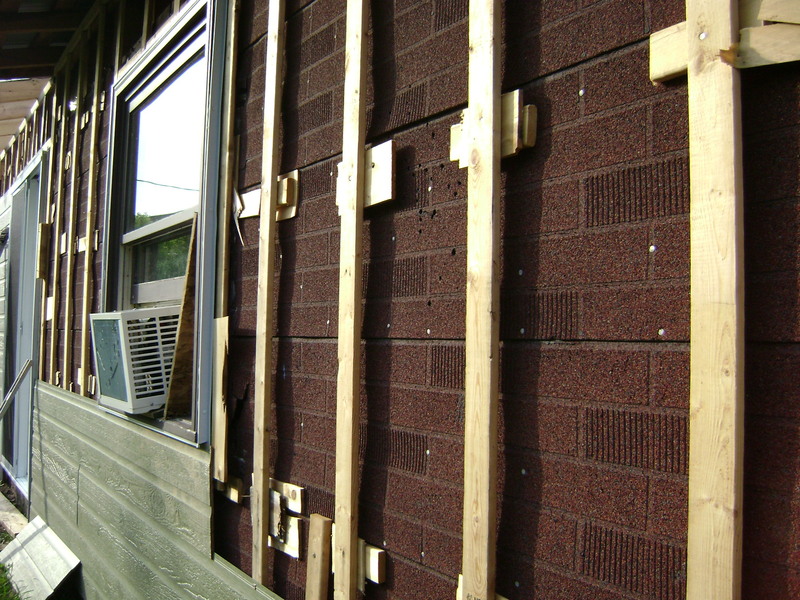 If your walls are straight and in good condition your siding can be nailed to the plywood. After the walls are leveled and the furring strips applied if needed, then be sure to chalk a level line around your home as a point of reference for starting. With everything level your home will look like a new one when finished. You can start by putting on the corners first, and then the J trim around the windows and doors and under soffits. Then apply the starter strip along the bottom keeping it level from the reference of your chalk line. 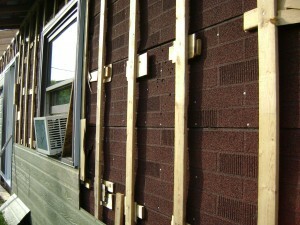 Your vinyl siding will snap into this starter strip and each row after will snap into panel below it. Nail your siding in center of cut out holes and do not nail tight as the siding needs to expand and contract, also leave a quarter inch of free play from corners and around doors and windows. Usually a drip cap is installed on top of windows and doors. It is cut two inches wider then the windows or doors, and a one inch deep cut is made in it at each end and this piece is folded over allowing the water to run off. The side J trim is cut one inch longer then height of windows, and only a one inch cut made in it which is folded over under the windows sill. This piece goes up flush with top of windows and cut outs on drip cap are folded over it. The bottom J trim is two inches longer then width of window with one inch pieces notched out of it so side tabs can be folded over it. 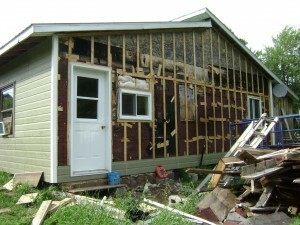 Continue installing siding up the wall from the bottom starter strip. |You might have dryer vents or electrical plugs to cut around so always leave a quarter inch for expansion around these also. The cover on dryer vents will usually cover your siding and little caulking will keep the water out. If one by three furring strips were used to level house, they are usually spaced sixteen inches apart. So in this case you would be nailing every sixteen inches on your siding. Also don’t forget to put furring strips around dryer vents, etc. in order to match up with the rest of wall. When the temperature is warm vinyl siding can be cut with a utility knife, score it first and then fold and snap the vinyl apart. Cut outs can be done with tin snips and a straight cut can be done on a cut off saw, making sure the blade has about sixty teeth or better for a smooth cut. 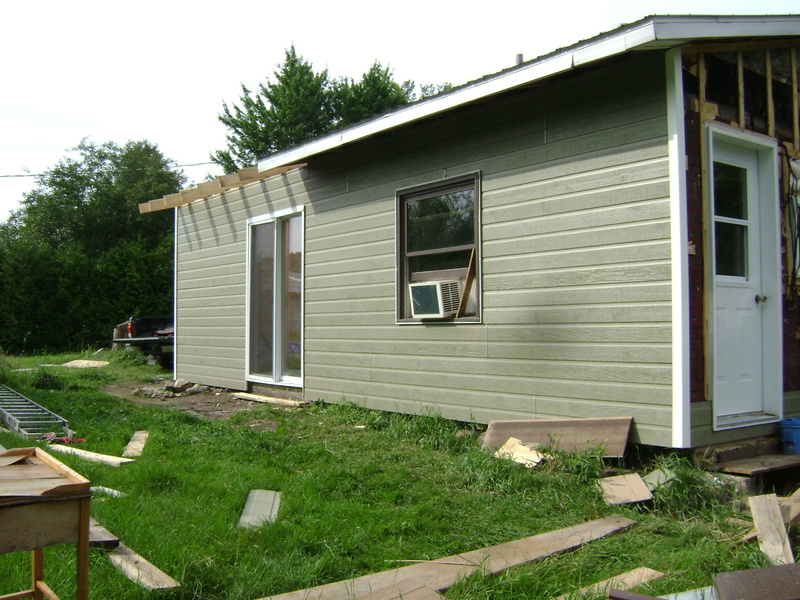 Siding today comes in a variety of colors, and that choice is usually left to the homeowners. Also siding today can have the appearance of stones or look like real wood or brick. The possibilities today are many, so is best to shop around for whatever you like. Once installed your house will look like a new one. 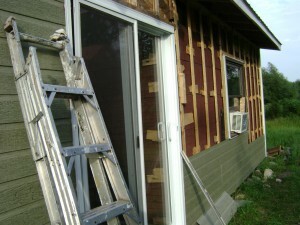 Siding can hide a multitude of mistakes that you can find on old houses.